The ibis hotel in Molins del Rei is ideal whether traveling for business or leisure. Located close to the highway, 9.3 miles (15 km) from Barcelona-El Prat Airport and less than 6.2 miles (10 km) from the center of Barcelona and the Camp Nou soccer stadium. 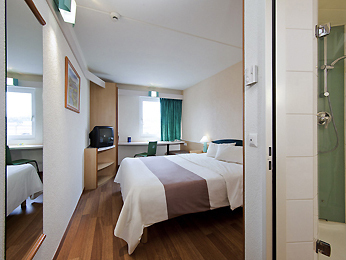 All of the comfortable rooms feature air conditioning, heating, TV and WIFI. Restaurant, 24-hour bar/snacks, parking and a meeting room with natural light and capacity for 70 people. Reserve a room at our ibis hotel in Molins del Rei Barcelona!